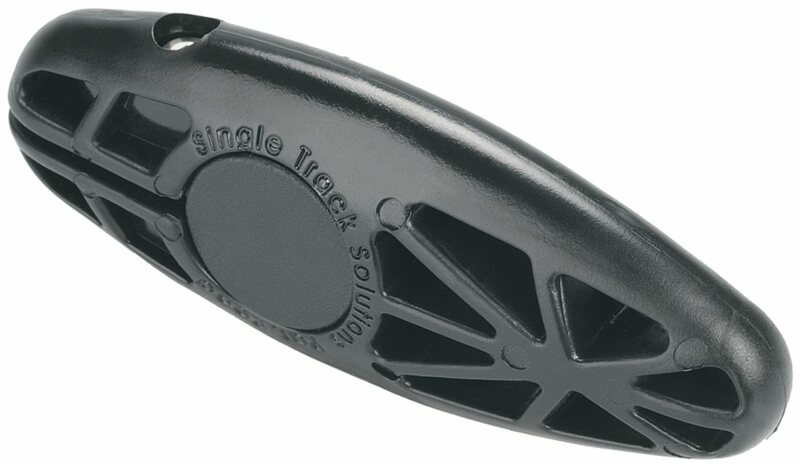 Singletrack Solutions ST-Lites barends version 2 feature an injection-molded resin that is both light and comfortable. I love these guys and while I have cracked the fasteners by overtightening, I have never had any problem with them moving around on me. In fact, because your hand is centered on the actual end of the handlebar, I can't imagine how you could torque these guys hard enough to make them slip. I have these bar ends on two mountain bikes and will be putting them on a third. I've never had any problems with cracking, and with a little carbon paste, slipping is not an issue. They are a great alternative to traditional bar ends and offer a great grip point for out of the saddle climbing or just changing your hand position on long flats. They are great bar ends, lightweight and easy to install, but are just a little bit shorter than I would like. Just enough to get a grip on and super light! I have had no problems whatsoever with slippage or stripping. The reviewers who had those problems installed them incorrectly. Clean the bar well, don't over tighten! I have had no problems with cracking or stripping. They have endured a couple of hard shots in crashes with no ill effects. You will need to either cut the ends off of your grips and then move the grips and shift/brake levers medially on the handlebars, or trim a few inches off the ends of your grips toaccomodate the bar ends. For the first five rides I ran these bar ends just tight enough so that I could move them with some effort. I secured them after a bit riding to determine where I really liked them. Guess i'm old skool and like to use bar ends as I really believe they help with climbing. Others have noticed they break during install but not a problem here. Just get it tight enough to not move. I'm old skool and still believe that barends help with climbs. Got these due to the light weight and light they are. Other reviews show breakage due to over tightening, but no problems here. Pretty small, but does the job. same as the others, cheap bolt that strips. i was able to get it tight but there are better products. not very ergonomic either, i now have two uncomfortable hand positions to choose from. These look great and could be extremely functional. I wear a medium size glove and found the bars to be about .5 inch too short. The shape is too rounded on the top side where the palm/body of my hand rest on them causing hand fatigue soreness and pain. My solution was to grind them down to create a wider contact area and that help immensely. I like the idea but for me they need to be a little longer and have a more ergonomic shape for my hand. As a side note I have been mountain biking since 1984 and have used bar ends since the early 90's. I get heckled at races for having them, but when I climb I live on them, including the most technical climbs. Not good. it moved the moment I started climbing. If the people made betterfastners, like the large outside nuts, it may be a good product. these bar ends are not worth purchasing. I bought a pair on sale for $5. you get what you pay for. Complete junk! the bar end wouldn't remain stationary on my handlebar. Kept on trying to tighten the nut and both sides stripped out.